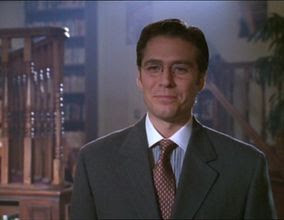 In Buffy, Wesley Wyndam-Pryce (played by Alexis Denisof) is the replacement sent by The Council to replace Giles as Buffy and Faith’s watcher after he had been fired in the middle of Season 3 for disobeying orders and growing attached to Buffy in a fatherly way. When he first arrives, he is certainly knowledgeable but also insufferable, pompous, reckless, and cowardly when faced with danger himself. He volunteers to give sensitive information when captured by a powerful vampire rather than suffer a slow, painful death. After Faith accidentally killed the deputy mayor of Sunnydale and then turned evil, Buffy and the Scoobies bypass his authority and continue to consult with Giles on what to do. Wesley finds out and calls the Council, which comes and unsuccessfully tries to kidnap Faith to bring her to trial in England. By doing so, both Wesley and the Council had damaged her seemingly forever and had caused her not to trust anyone any longer. By the end of Season 3, Wesley tries to make amends with Buffy and volunteers his services in the fight against the Mayor at graduation after Buffy had quit the Council. In the last episode, he is knocked down by a vampire in the very beginning and taken away in an ambulance. Later, in the “Angel” television series, he returns in the first season as a “rogue demon hunter” who battles evil on his own — with still-comedic results — after also having been fired by the Council. Over the years, however, he becomes very adept at all forms of magic and battle and is, along with Cordelia, Angel’s closest friend and ally. His loyalty to Angel and cold, pragmatic behavior to do whatever is necessary often gets him into trouble — most significantly when he kidnaps Angel’s infant son to protect him after hearing a prophecy that Angel will kill him. In a complicated story, Angel’s son, Connor, is taken to a hell dimension and returns as a crazy, vampire-hating teenager since time had moved differently for him. Angel nearly kills Wesley out of anger. By the end of the “Angel” series, Wesley and the gang have taken control of the Los Angeles branch of Wolfram & Hart and decide to use it to fight the evil law firm. In the final battle, Wesley is killed by a evil sorcerer, though his death provokes Illyria, the goddess who had killed Wesley’s girlfriend Fred and taken over her body, to kill him in revenge. Wesley’s death at the end of “Angel” is not the last that we see of him. You can see how his story continues in the “Angel: After the Fall” comic series (first collection, complete set).